CHINA, IVORY/GOLD COFFEE SAUCER 5.75"
IVORY BODY WITH DOUBLE GOLD BAND. DAMAGE WAIVER DOES NOT APPLY. 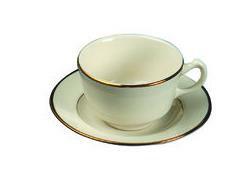 * Please call us for any questions on our china ivory/gold coffee saucer 5.75 inch rentals in Mount Pleasant MI, Alma MI, and Saginaw MI.